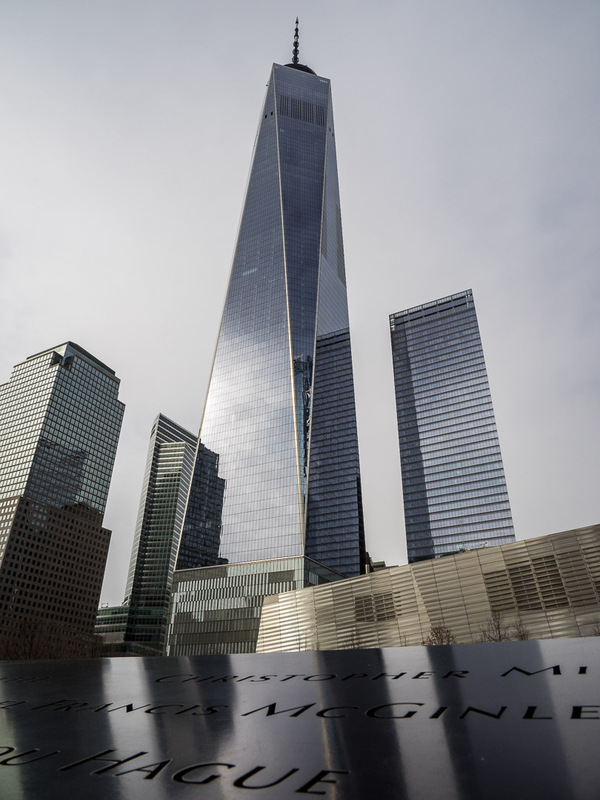 The 9/11 memorial was created aftermath of the attacks and destruction of the World Trade Center for the victims and those involved in rescue and recovery operations. Center point and freely accessible from the surrounding streets are the two reflecting pools in the footprints of the fallen Twin Towers, created by architect Michael Arad and landscape architect Peter Walker. They were designed to symbolize the loss of life and the physical void left by the attacks, with the waterfalls making the site a contemplative sanctuary in the middle of the ever buzzing city. More than 400 planted swamp white oak trees fill the plaza around the fountains. 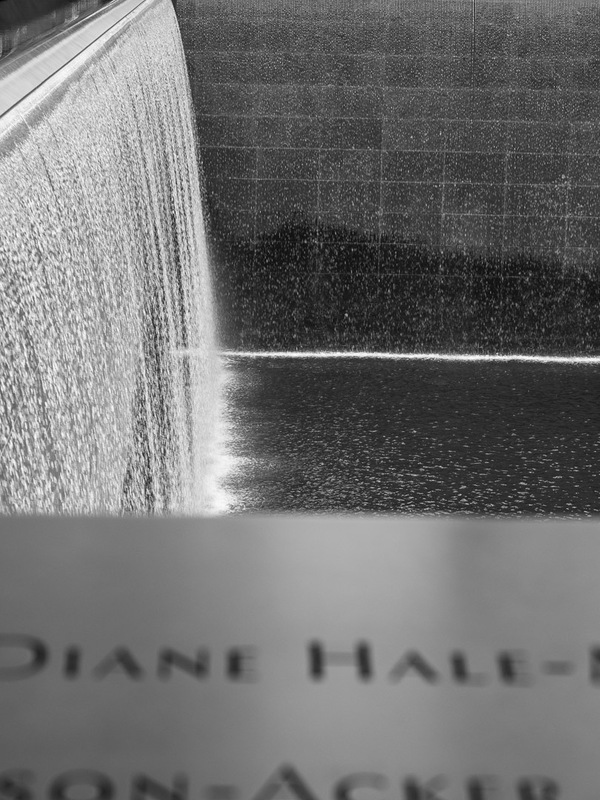 The names of 2,983 victims are engraved in 152 bronze parapets around the memorial pools, commemorating the loss of life in the September 11 attacks and the 1993 World Trade Center bombing. 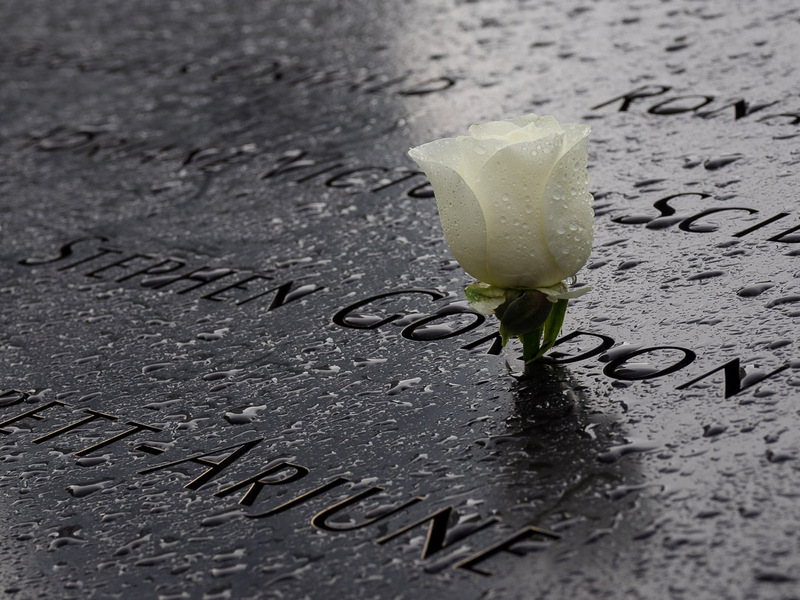 Each day, the Memorial staff puts a white rose in the name of a victim that has birthday. Below the plaza and the reflecting pools is the 9/!1 museum, opened to the public in 2014. Designed by Davis Brody Bond, the museum is about 70 feet (21 m) below ground and accessible through a glass pavilion next to the reflecting pools. It resembles a partially collapsed building (mirroring the attacks). Descending from street level to the entrance inside, visitors pass two tridents from the Twin Towers. One of the museum’s walls is an exposed side of the slurry wall retaining the Hudson River, which remained intact after the attacks. 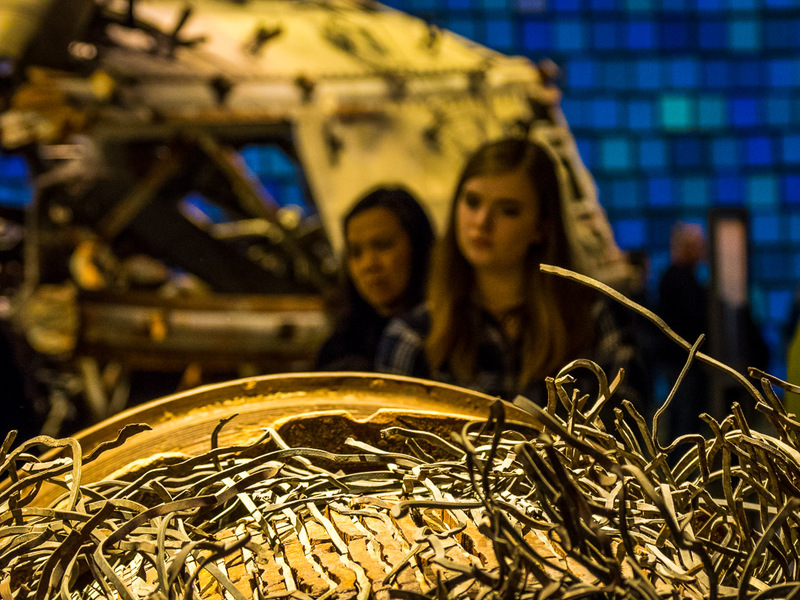 On display are many artifacts from Ground Zero, including a wrecked fire engine deformed from the collapse, pieces of metal from the tower (like the wrecked antenna that you see in the photograph below) as well as many personal belongings of victims and survivors. Below the pools, in the footprint of the towers, are special rooms, one displaying pictures of all victims and their personal stories, the other one displaying recordings of survivors and first responders (including 911 phone calls), photographs from the wreckage and other media detailing the destruction (including the crashes, collapse, fires) and the cleanup afterwards. 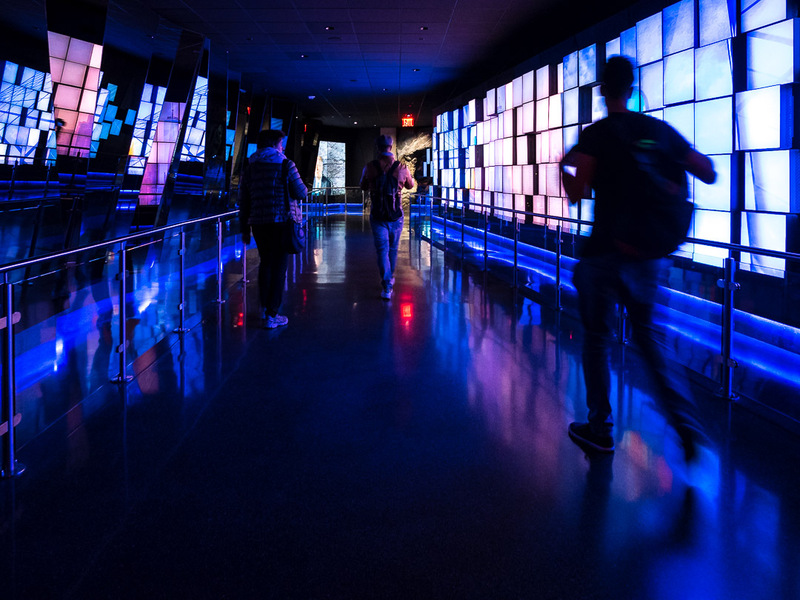 The museum is designed to evoke memories without additional distress, particularly to first responders and the families of victims. And I have to say it is a worthy place of remembrance, in which you easily can spend a whole day. What looks like a space ship here is the new main building of the World Trade Center train station and its reflection in the glass wall of the 9/11 museum (you all know I’m much into reflection shots). Called “Oculus”, it opened in March 2016. 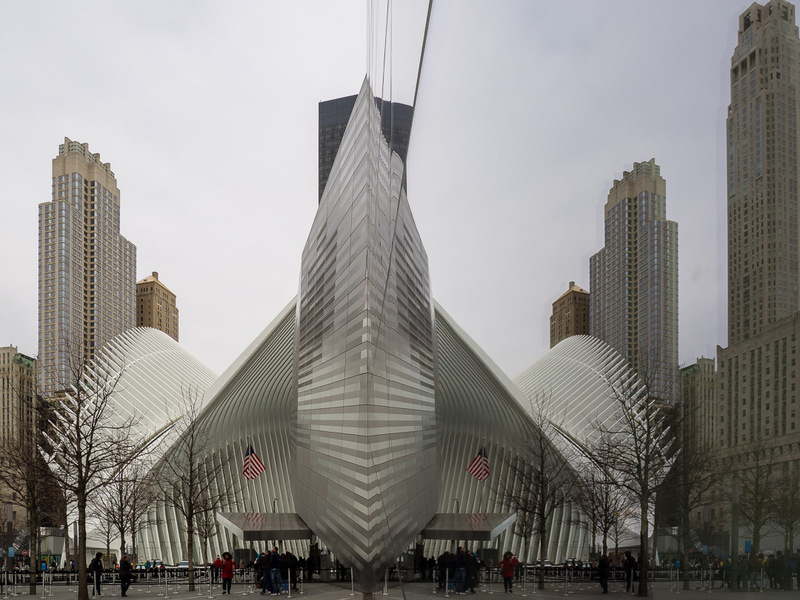 While the PATH station is four floors below ground level, the $4 billion Oculus, consisting of white ribs that interlock high above the ground, houses the Westfield World Trade Center mall. The new station has been controversial due to its high costs and extended delays. 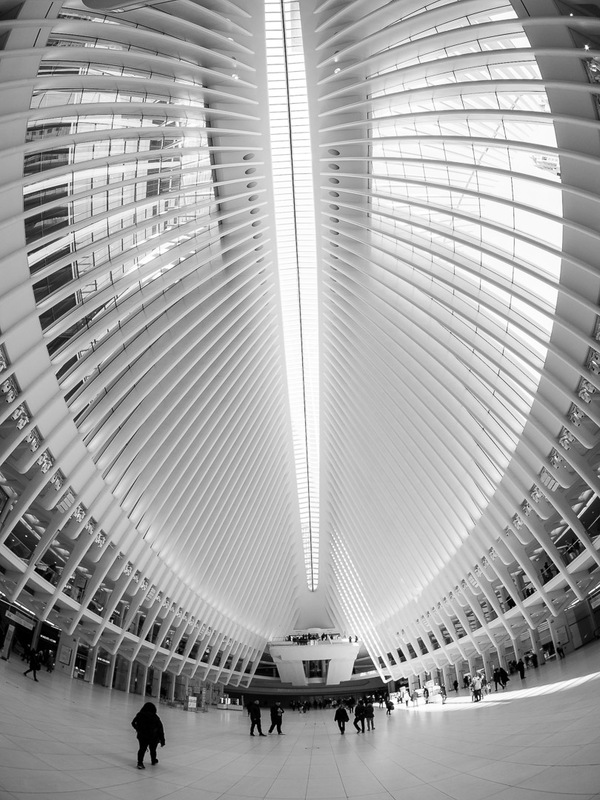 But the building, designed by Santiago Calatrava, is an architectural pearl indeed. Finishing off the trip down memory lane we visited the observation deck of One World Trade Center, the main building of the rebuilt World Trade Center complex in Lower Manhattan. I will not go into details here, but rather do a separate post about the tower and the viewing platform on the 100-102 floors, so you can compare the panorama from there with the ones from the Rockefeller Center and Empire State Building I blogged about in earlier posts, but here are some initial impression from the entrance and the view towards Midtown Manhattan. All photos were taken with my Olympus OM-D E-M1 and the mZuiko 12-100mm F/4, apart from the shot inside the Oculus, where I used my WALIMEX Pro 7,5mm 1:3.5 Fish-Eye. RAW conversion and post processing in Lightroom Classic CC. If you want to pick up your camera this weekend and are still looking for some fresh inspirations what to shoot, visit my free Learning Center . I will spend is Memorial Day weekend in the US and will head to the Emerald City of the Pacific Northwest, so stay tuned for some street photography and impressions from Seattle. Wish you all a splendid weekend! I have never been to NY. This is inspiring! Thanks, happy you find it inspiring. Wish that you get to see NYC one day! Great photos Marcus. I love that you shared the story of your time visiting there as an exchange student. I haven’t made it to NYC yet, but I had an acquaintance living and going to college at the time of the attack. I imagine that the memorial is is quite moving. I’ve seen photos from inside the Oculus. It seems like a some spectacular architecture. Thanks for your wonderful comment, Amy! Your whole experience in New York looked awesome, as weĺl as the accompanying photos. Ground Zero looks well worth a visit, and that spaceship building – Wow! I was distressed that my husband didn’t want to go to Ground Zero during our last visit, even though our hotel was only four blocks away. After he sees your photos and reflections I think he’ll be relieved to see the sensitivity with which the memorial was handled. Beautiful photos, Marcus. Thanks for your wonderful words, Heide! The museum and memorial is a worthy space to remember, all done with much dignity. Even though I in the Philly area, and have been to NYC several times since 9/11, I’ve never been to Ground Zero. Good reflections. I need to go. You should! A great place to remember and reflect. A worthy memorial! Marcus, that was unforgettable time for you in New York. I can tell it just looking at your sensational photographs. Seattle also one of my favorite cities. Have fun there, take a lot of pics to share with us and go to places where they serve tasty fish. That was a great read. Thanks I love the pciture of inside the space station. Well done. 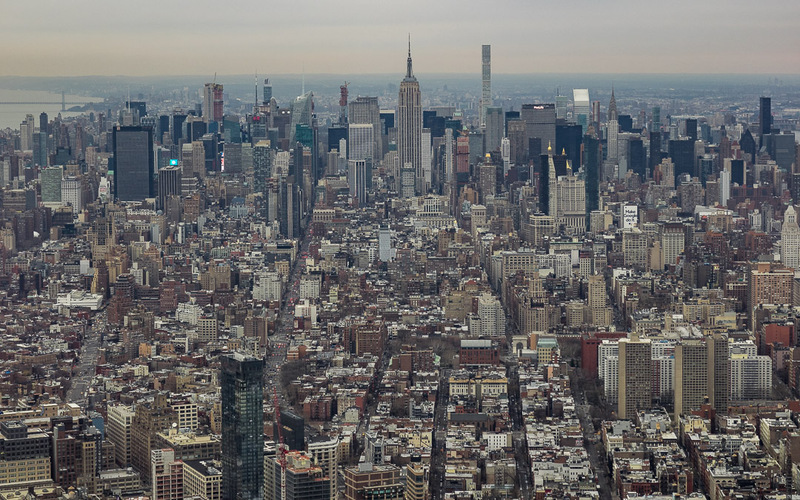 Great photos of NYC Marcus. Enjoy your visit to Seattle, it’s ages since I was there so I’ll look forward to reminiscing through your photos! Bank holiday weekend here too and naturally it’s raining!